U.S. President Donald Trump told reporters in Helsinki following his talks with Russia’s President Vladimir Putin on Monday (July 16) that Israel’s safety is important to both world leaders. 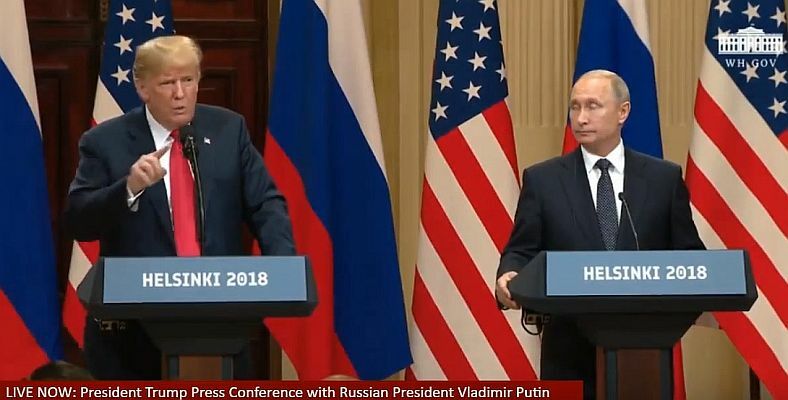 Speaking at a joint news conference together with Putin after the summit, Trump said bluntly in response to a question about Syria, “President Putin also is helping Israel. And we both spoke with Bibi Netanyahu, and they would like to do certain things with respect to Syria, having to do with the safety of Israel. This entry was posted on July 16, 2018 at 7:27 PM and is filed under Uncategorized. You can subscribe via RSS 2.0 feed to this post's comments. You can skip to the end and leave a response. Pinging is currently not allowed. Speaking in joint press conference after one-on-one Helsinki summit, Russian president says the pair agreed Israel’s security would be ensured on the Golan Heights in accordance with 1974 separation agreement; ‘Creating safety for Israel is something that both president Putin and I would like to see very much,’ says Trump.